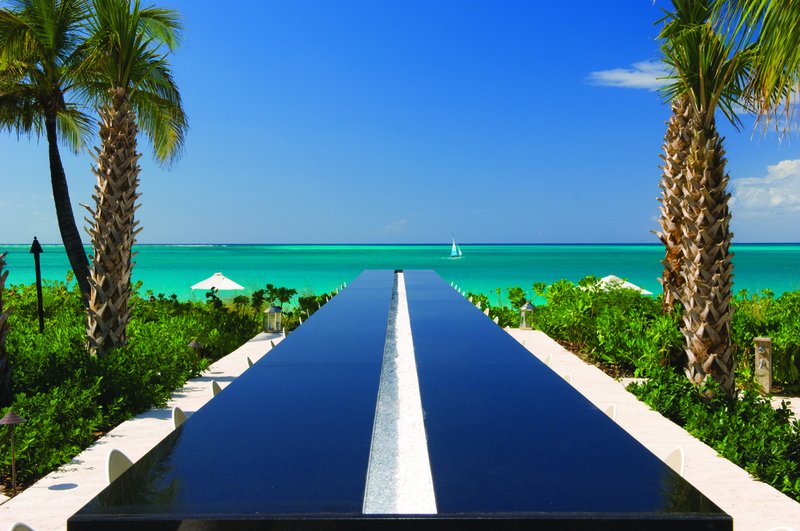 Passported's editor, Nikki, just got back from a family trip to Turks & Caicos. Check out her picks for the best places to dine with kids on Providenciales. Many of the best restaurants are in the resorts that front Grace Bay Beach, so you can plan a restaurant crawl from breakfast to dinner without ever leaving the sand. One of the many gorgeous view from Grace Bay Club. Infiniti Grace Bay Club's signature restaurant, it's one of the island's more splurge-worthy options, but the food and alfresco beachfront setting live up to the hype. Just be sure to make an early reservation to catch the beautiful sunset. Toddler-age kids will be distracted by all the fire pits and huge swinging lanterns, so expect to be doing a few laps of the dining areas! Reservations recommended and kids' menus and highchairs are available. Grill Rouge The hotel's more casual, affordable eatery right next door to Infiniti, so the sea views are just as good. Good option for lunch. Kitchen 218 Not on the beach, but the excellent food makes it an essential stop for dinner. Order two of the ceviche appetizers, splurge on the steak and skip the tofu! The kids' menu has a red snapper or chicken with mashed potatoes and veggies, which was a nice change from "pasta with cheese." During our trip, the restaurant was packed on Friday and Sunday, but strangely quiet on Saturday. Food at the beach restaurant is disappointing and expensive, but there are kid-friendly options like wraps and burgers, as well as the vacation-essential frozen margaritas and piña coladas for parents. Zest Very good for light bites just a few steps from the beach. Tasty salads, affordable wines and a friendly cat to keep toddlers entertained. The table next to us was settling in for a long, rose-fueled lunch, which would be the optimal choice here, but kids' are welcome and highchairs available. There's no dedicated kids' menu, but posh pizza should keep everyone happy. Closed between 5 - 6 p.m. In case you need a break from the beach, this big resort is in the marina and has a big pool, manmade beach and highly-rated kitesurfing school. Grounds are huge, so good for busy toddlers. Salt Bar & Grill Not the best location adjacent to car park, but the fresh fish dish with rice and beans was excellent. There's an affordable kids' menu and lots of outdoor games (horseshoe, giant chess etc.) to play after. The signature restaurant, Fire & Ice, is a better option for dinner. There's also a big market here for any supplies. Like all the supermarkets on the island, however, everything's incredibly expensive. Hemingway's A fine option for lunch on the beach and $10 kids' dishes. Somewhere Cafe & Lounge A sweet little beach cafe with surprisingly good tex-mex. Fish tacos are excellent and desserts serious crowd pleasers. Bit of a bar vibe and it was definitely getting rowdier as we left around 9.30 p.m., but we saw lots of families and kids running around on the beach. Try and catch the live music on Friday. Coco Bistro Provo's best-known restaurant in a romantic, inland setting surrounded by towering palm trees. It was closed on Monday when we tried to go, but everyone we spoke to said it's worthy of the hype. Very pricey, so better for date night if possible. Don’t throw your sun hat at us, but we have a holiday travel update. Yes, in August. The data crunchers at Skyscanner have confirmed what we’ve noticed for years — this blazingly hot month is the best time to book your winter travels. During the week of August 10th, in particular, travelers can save between 5% and 19% on their travel bookings. Read on to find out where we're booking Passported families. Winter is coming. No seriously, winter is coming. To keep the polar vortex blues at bay, we’re rounding up eight of our favorite warm-weather getaways a non-stop hop (forget the skip and jump) from the East Coast. This way to the beach.